The churches of Llanallgo and Llaneugrad have been in a single parish since at least 1253 when we were taxed 17s9d to help pay for the crusade then being organised. In March 1320 we had a murder in the church! Three prisoners escaped from Beaumaris Castle and were chased as they made for their homes in the Anglesey wilderness. One of them leuan Cwta was run to earth in Llanallgo Church where he sought sanctuary at St. Gallgo's altar. Sanctuary was not granted and he met his death there. The name of our first recorded parish priest was Peter de Mostyn. For two periods in the last two centuries there was also a curate in the parish but it would be difficult to imagine what two clerics would have done to have spent their time profitably in the parish. Robert Griffiths was the incumbent in 1623 when he was reprimanded by the bishop for negligence in his duty. 'The sd. parson for not going on perambulation these 2 years'. He had also upset the parishioners because he let his cattle graze in the graveyard and did not clean up after them! The parish to-day has had two further parishes annexed to it. These are two churches dedicated to St. Michael. One is at Penrhosllugwy and the other at Llanfihangel Tre'r Beirdd. These two churches are associated with Morisiaid Mon. Penrhosllugwy has a burial stone which is dated to 525. It is a very ancient site indeed. It also has some Royal Charter victims' graves. To-day the three parishes have a total civil population of 1500. Of the four churches serving this population Llanallgo is the principal church. We have more ministers in the church now than at any previous time in its history. On alternating Sundays’ there are 5 & 6 acts of worship. See page one for list of services. The weekly 10 a.m. service is conducted exclusively in Welsh. 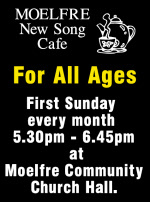 The parish has an ongoing association with the local Moelfre school. The picture shows former Bishop Saunders Davies, Revd. Canon Dr.. Graham Loveluck (Retired). Parts of the chancel and the transepts date from the 15th century. Parts of the east window date from the same time. 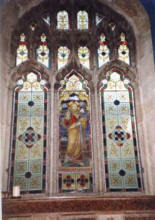 The glass of the east window is Victorian and portrays Jesus walking on the waters of the Sea of Galilee stilling the storm and reminding disciples of His presence. In the south wall of the chancel there is another contemporary window with two cinquefoil lights in a square head window, others are found in the eastern wall and in the south wall of the south transept. In the north transept there is another in the east wall. The roofs are mainly modern but a few trusses may be late medieval. In the chancel there is a wagon roof which is simply decorated. It obscures the point of the east window and the additional trusses which were placed to strengthen the roof. A sketch of 1859 shows the wagon roof in the chancel together with a rood screen but there is no sign of the wagon roofs in the transepts. These must have been added later in the restoration during late Victorian times. On 1st September, 2004, disaster overtook Llanallgo Church. Thanks to an electrical fault caused by rodent activity a fire started at about 1 p.m. Providentially it was discovered by Pat Parry of Marianglas who was leaving for Manchester Airport on holiday. She called in to the church to add her birthday flowers to the altar flowers. Discovering the fire she alerted the emergency services and two fire tenders from Amlwch and Llangefni were on the scene within minutes. By 1.40 p.m. the fire was extinguished. 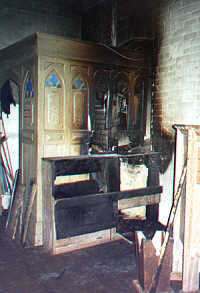 The photograph shows the seat of the fire and the damage caused to the vestry. Smoke damage was considerable. 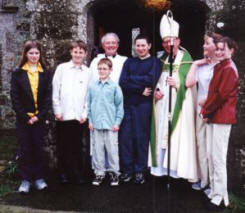 Seven weeks to the day the church was re-opened by Anthony, Bishop of Bangor.